BRAZIL. Japan's International Cooperation Bank is to invest R$ 1.2 billion (€420 million)in Brazil's bioenergy program. In 2004 and last year, Japan already studied and signed deals to import ethanol and biodiesel from the country. The new investment focuses on three themes: (1) support for small independent farmers who will integrate food production and biofuels feedstock, (2) support for grassroot organisations and energy farmers who work within a framework of cooperatives and (3) technology transfers (on a higher governmental level). Especially the first two of those are of interest to the BioPact. The Bank's CEO says that the program is part of Japan's new energy strategy for the coming decades, in which biomass plays a crucial role. Japan's own potential is limited, which is why it is looking at closing bilateral deals. June 1, Diário do Grande. MOZAMBIQUE. 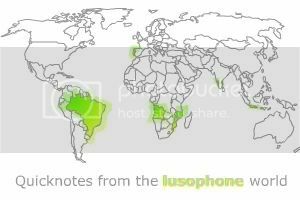 Mozambique starting ambitious biodiesel and bioethanol programmes, based on abundantly available sugar and soy. In total more than US$ 200 million is being invested, involving several companies, amongst which "Mozambique Biofuel Industries", which obtained permission to use 500,000 hectares of land to produce feedstock. Mozambique's state-run oil company Petromoc has signed a cooperation agreement with South-Africa's Cofamosa to invest US$ 150 million in an ethanol plant in Moamba, which will use sugar cane. Nutasa, a portuguese group is building a similar plant in Maputo. Meanwhile the Mozambican government is building its second (US$ 14 million) biodiesel plant near the capital Maputo, this one aimed at producing the green fuel for export to the European Union. This biofuel fever will provide thousands of jobs to Mozambican sugar, jatropha, and soybean farmers. It will also reduce the country's depence on imported petroleum. Canal de Moçambique. PORTUGAL. The Algarve's regional Energy & Environmental Agency has studied a new energy and mobility concept for the sparsely populated and dry province. It proposes to use sand-buggies for the public transport fleet which it wants to run on locally produced biodiesel (because importing diesel is expensive for lack of infrastructure), and on batteries that are charged by the wind turbines that take advantage of the province's very high wind potential. June 14, Jornal do Algarve. BRAZIL. Embrapa - Brazil's agroindustrial giant - has patented a new, semi-portable thermal gasification technology which produces liquid biofuels much more competitively than transesterification and fermentation plants. The technology is aimed at groups who want to produce biodiesel, ethanol or biokerosene from biomass without the need for catalysts, in a decentralised way. It will be introduced to the market in the first semester of 2007. June 7, Valor Online. BRAZIL. This year's Energy Summit in Brazil, which will be held in july, will focus amongst other things on biomass and bioenergy production infrastructure, and on technology transfer programs aimed at spreading the knowledge about tropical biofuel crops and processing to other Latin American countries. June 12, Portal National de Seguros. BRAZIL. Researchers defend controversial eucalyptus plantations that produce fibre, fuel, charcoal, paper pulp and methanol. Scientists reject several of the environmentalist critiques about (fast growing) eucalyptus monocultures. When planted on Brazil's many sloped lands, integrated on a local level with lower-lying fields (in valleys), they can solve the problem of soil erosion and nutrient loss. Biomass growing on slopes often gets logged by local people in search of fuelwood. The result is that rainwater can freely run down the slopes and causes mudslides, nutrient loss and water logging in the lower lying fields. Moreover, eucalyptus trees protect soils because they aren't harvested annually, as is the case with other crops. The critique about eucalyptus depleting water resrouces is unfounded, adds the Agency for Agroforestry Research, because in comparison with many wild biomass stands, it consumes considerably less. Moreover, monocultures allow for planned and more efficient management of the water resource, which may benefit local communities. Finally, in comparison with ordinary agriculture, the silviculture of eucalyptus requires much less fertilizer, meaning it pollutes the hydrological system much less. May 22, more discussion about this controversial crop at Celulose Online. Informações e negócios no mundo da celulose. PORTUGAL. After the recent news that Portugal is building the world's largest solar power plant, its minister of Economy and Innovation has announced that the renewable energy sector will be getting another boost because of investments in biofuels production and biomass power plants. This makes the green energy sector Portugal's fastest growing economic sector (qua investments). Of those, around €120 million goes liquid biofuel production and, over the coming years, €450 million to biomass power plants. Jornal de Negócios. BRAZIL. 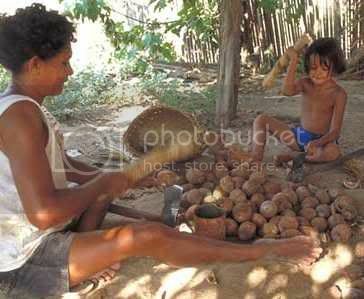 Babassu shells can produce 260 MW of biomass energy for poor forest communities. Babaçu is a palm tree native to Brazil, widely grown there and provides an important industrial and economical resource because of the oil extracted from the kernels. The oil is similar to coconut oil and is gradually conquering that market. Since the trees are not grown in plantations, but are used as they stand in the wild (in the Amazon), its nuts are harvested manually by some of Brazil's poorest communities. They are often left with huge waste-streams of shells after they have removed the oil-rich kernels (which is done manually as well). Unicamp's Faculty of Mechanical Engineering studied the potential for using this waste in efficient co-generation plants, and sees a great opportunity in it for rural electrification. Each year, some 2.9 million tons of babassu shell are wasted. Kaxi, Agência de noticias da Amazônia.